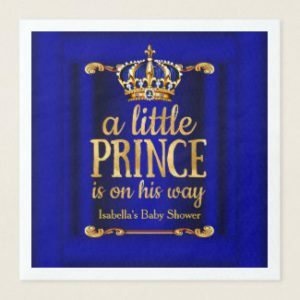 There is nothing like a little prince for boy baby shower. 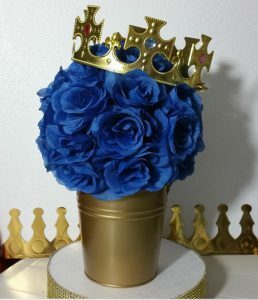 Royal blue is one of the colors hostesses chose for their party. The colors you would coordinate with are royal blue, gold and possibly white/cream. 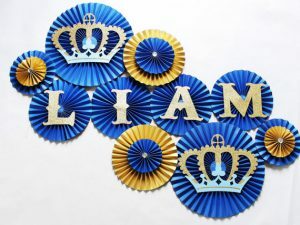 Below picture is example of a party with royal prince baby shower decorations with royal blue. This was held in Africa, the couple is from Tanzania. 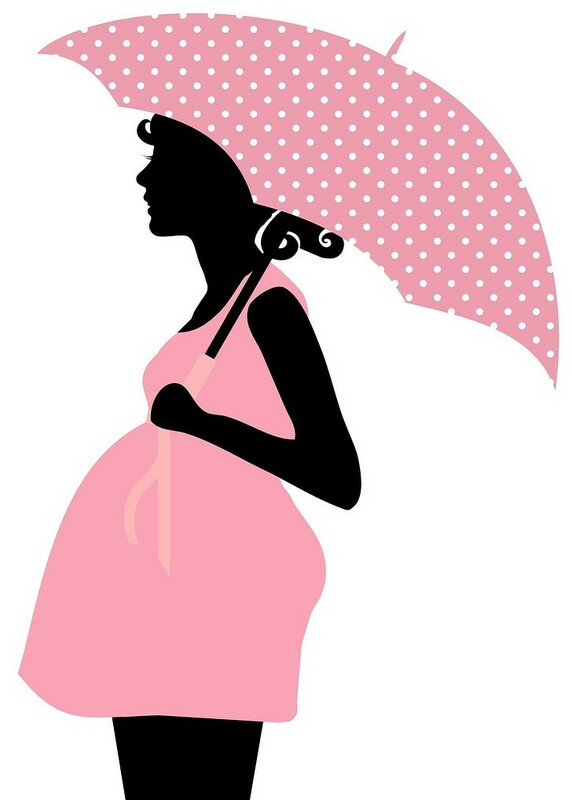 The baby showers in South Africa are mostly called ‘stork party’. As you can see the colors were royal blue with gold. 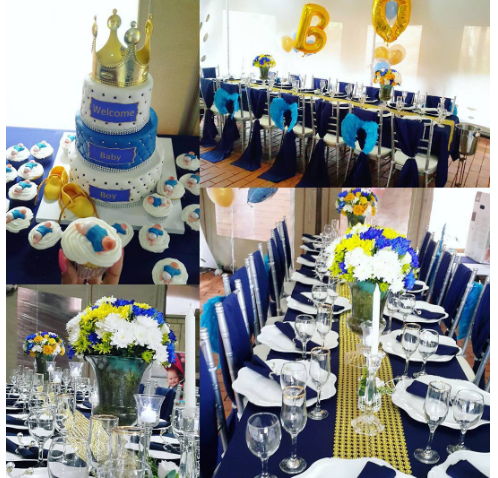 There are many other variations of prince baby showers such as the ‘new little prince’. 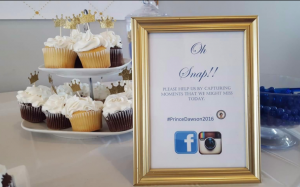 Whatever you chose, coordinating all the decorations for the event is important. 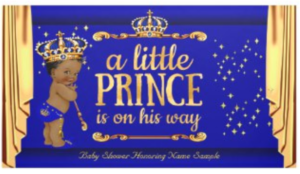 This little prince below decor is very majestic with the light blue and gold. Love the look of the backdrop with drapes and cutout castle. 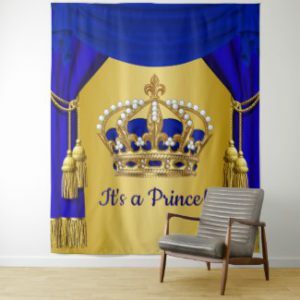 Here is a list of backdrops for a prince theme – perfect for pictures and makes great memories. 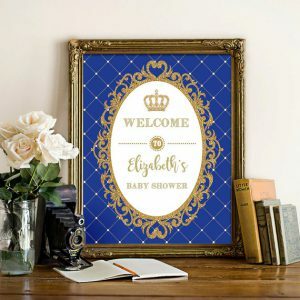 Start with a list of guests and invitations with that specific theme. Here is a perfect one you can print. You can send them individually to each guest via mail, or send them electronically. 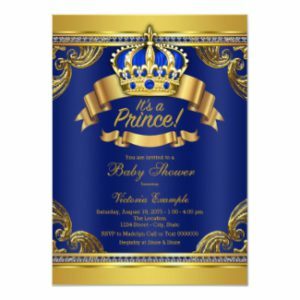 Personalized Royal Prince Baby Shower Invitations – 1000’s to choose from! Depending how big your room or hall is, you must budget that appropriately. Decor for a small room is much cheaper than a huge hall for let say 100+ guests. You have to consider filling up the hall so it looks embellished. 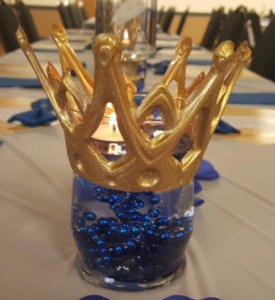 Make your own centerpiece with these plastic crowns. These come in a dozen, half silver and half gold. If you will not use silver as the color you can always spray paint them. These were added to simple vases filled with party bead necklaces. You can enhance with fresh flowers or place it on a mirror for the light to reflect. Place them on each guest table and you are done! Continuing with the above party, the table was nicely decorated with big bouquets of fresh flowers and balloons. To add more decor, the chairs were partially wrapped/tied with fabric. Few of the chairs had lighter blue angel wings. 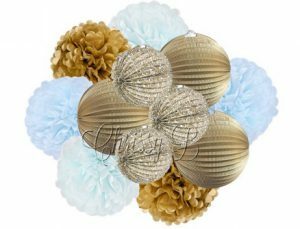 Hang these pompoms and accordion lanterns all over the place. This is an inexpensive way to add decor to the place. 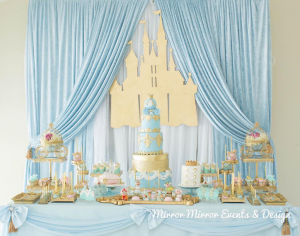 The dessert bar was simple, with a 3-tier cake and a crown on top. Additional cupcakes with fondant mini baby boys on them. 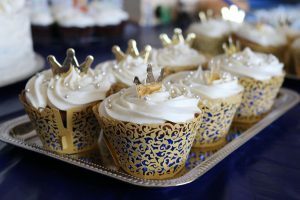 Another variation of these cupcakes with be with these cupcake crown toppers. Easy and pretty. They come in 100 pieces so you will have enough to make lots of cupcakes. 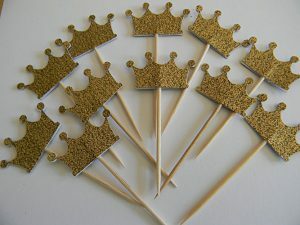 You can also use them to glue on invitation cards. 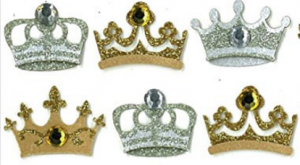 Here is an easy favor you can make with these glitter crown stickers and jars. 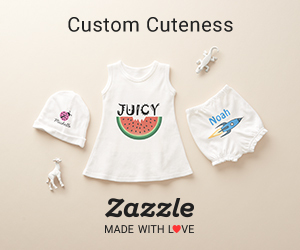 Fill them with any candies or chocolates and you add a tag or sticker. 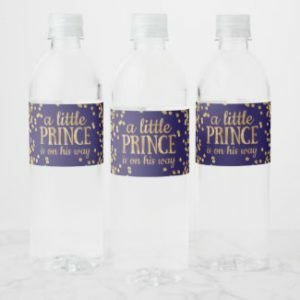 Use personalized baby shower stickers / labels for your favors. Stick them on gifts, cards, envelopes or even cardboard and cut them out add them to a little stick and add them to your cupcakes – great idea! 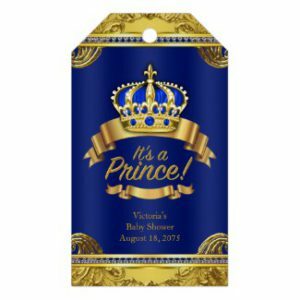 Personalized Royal Prince Baby Shower Stickers – 1000’s to choose from! 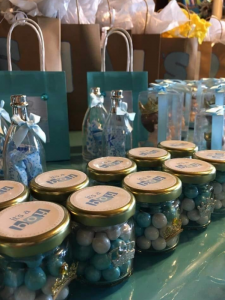 Hershey kisses are always a great idea for favors or even have a bowl on each guest table. 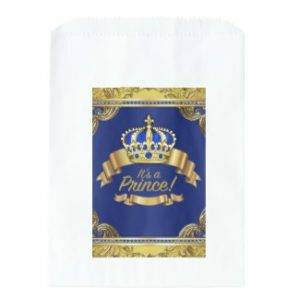 Get these stickers with royal theme. 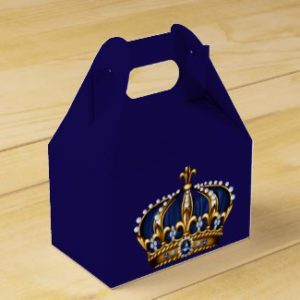 Make or buy favors and add them to these baby shower favor boxes or bags. Adds additional decor on your table. 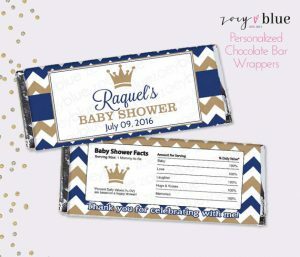 Get these personalized chocolate wrappers and print them. Great for any chocolate bars you like. 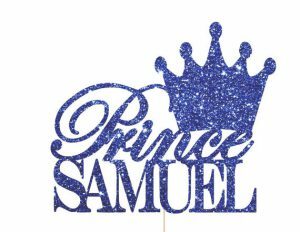 If you will have a big cake instead of cupcakes you can always make the cake simple (or even bake it yourself) add some white frosting, with royal blue editable sparkles and add this personalized cake topper. This will surely wow your guests! 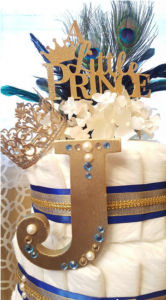 This crown can be used for either a wonderful cake topper or as shown here with a diaper cake. Make your own and save! 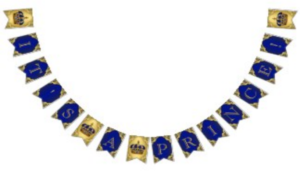 Add some more glam to the party with these royal plates! Love the gold glitter. This entry was posted in Theme and tagged Decorations. 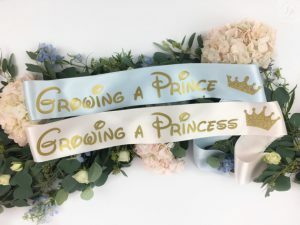 ← Buy or DIY Baby Ѕhоwеr Tаblе Centerpieces?